On a bright, cold, December day in Walsall I'm at Borneo Street allotments being shown some of the seeds that holders have been saving after a pretty good growing season. Some like beans are familiar to me, others like some tiny seeds from plants used in curries are less so. "Seedy Sundays" and ad hoc seed swapping are a big part of life here and indeed on many other allotments. It makes sense in terms of saving money and also in terms of plant genetics. If you have a plant variety that does particularly well in your patch it should do well in nearby allotments too. In Borneo Street they are particularly proud of their huge diversity in allotment owners and that means there's a huge diversity in plants being grown here. 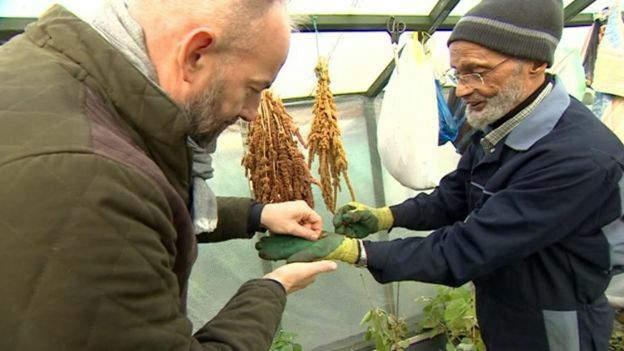 So all this varied plant life and thriving seed swapping has attracted the attention of researchers from Garden Organic in Coventry and the University of Birmingham. They're keen to learn more about seed swapping and to encourage and promote it as an idea. But swapping could also have an huge impact far beyond the Borneo Street allotments. On these allotments you find a huge number of different plants and that's in contrast to so much commercial fruit and vegetable growing. It may be innovative and successful, but our farmers are increasingly focusing on a few high performing plant varieties. The problem is this represents a huge genetic narrowing of certain crops and if a nasty disease or environmental change comes along, that leaves us vulnerable. So the genetic diversity we find in our allotments offers a resource. A massive genetic reserve that we might one day need to call on. Of course back on the allotment seed swapping doesn't always work out. Steve Rollings grew plenty of lemon crystal cucumber seedlings and shared them around Borneo Street allotments. But everyone else's thrived while all his seedlings died. Such is allotment life. But it's a story that also illustrates on a small scale why spreading your plants and genetic diversity around is so important. When swapping seeds with abroad its best to check with Defra list especially food seeds even with in the EU. Australia also America are very very strict. You could land in prison.